The Guitar Column: TS808 Tubescreamer Owned By Stevie Ray Vaughan On eBay! TS808 Tubescreamer Owned By Stevie Ray Vaughan On eBay! This eBay listing had me reading it twice and then a third time to make sure that it wasn't just a clever item description to draw attention. Folks, it's Holy Grail time again at eBay! Up for your perusal is what the seller claims to be a genuine Ibanez TS808 Tubescreamer formerly owned by Stevie Ray Vaughan! 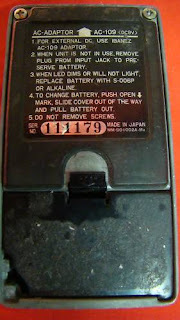 Tubescreamer connoisseurs will notice that this pedal is from 1980 with the 'registered trademark' above the Ibanez logo and the sought after JRC4558 chip in the circuit, coveted for its warm, 'brown sound'. Interestingly, pedal mod guru Analogman's Tubescreamer history page also lists this pedal with serial number 111179 as belonging to Stevie Ray Vaughan and Cesar Diaz, Stevie's tech at the time. Vintage TS808's go for a pretty penny these days but given its pedigree, I anticipate that the price of this particular pedal is going to go through the roof. But as always, do the necessary research before committing! vielleicht ist der ts-808 mit der seriennr 107121 bei ebay für euch von interesse. 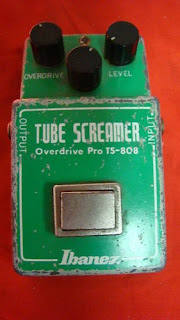 oder; ebay suchen: Ibanez TUBE SCREAMER Overdrive Pro TS-808, Seriennr. Trademarkzeichen etc.